Recurring donations are covered, as well as why you don't want to spend too much time in this electronic age attempting to raise money over the telephone. Crowdfunding and mobile giving are two aspects of charity fundraising that should not be overlooked, and planning for donor retention is essential to make future fundraising efforts successful. 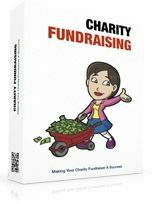 You will learn these and other proven practices for running a successful fundraiser in this guide. If you are having a hard time coming up with ideas for fundraisers, we have listed several low-cost, high-return campaigns that routinely make good money for charities in any field. Let's get started making your next donation drive a hit by covering why it is important to focus your efforts on a niche audience, rather than anyone you meet. It is harder to sell ice to Eskimos rather than someone in Florida. That is probably not earthshaking news to you. It is difficult to sell or even give away something if the demand for that product or service is very low. Eskimos and other inhabitants of northern polar regions need only step outside their front doors to see all the ice they could ever need. Folks in hot and steamy Florida pay good money for bagged ice nine or ten months out of the year. This is a simple example of why it is important to identify those people that are more likely to support your fundraiser rather than targeting everyone and anyone you encounter. Fundraisers can be time-intensive, difficult, and cost a lot of money. It only makes sense to maximize the amount of money you create with each donation while simultaneously working as efficiently as possible. Identifying good donor prospects keeps you from wasting valuable resources and time, so let's take a look at a few things you need to keep in mind before you target potential donors. An avatar is a profile of the perfect prospect you could possibly encounter. What does he or she look like? Is this person a woman or a man? The age, gender, interests, income level and other demographics of this avatar need to be considered. It probably comes as no great surprise to you that a homeless pets charity may attract the attention of interested donors which look different from those people who prefer to give their donation dollars to disaster relief funds. This is why your development team needs to brainstorm and flesh out the details of your perfect prospect. When you try to sell hamburgers to meat lovers rather than vegetarians, you're going to be more successful. If your charity has been around for a while, you no doubt know how much money you need to generate on average from each donor for you to hit your revenue target. This is important to know, because although someone might love your organization and really want to contribute, that individual may not have enough expendable income to get involved. This doesn't mean only targeting wealthy prospects. As you know, any and every gift is accepted with welcome arms and heartfelt thanks. It does, however, mean spending most of your fundraising efforts targeting individuals that have shown a propensity to donate at a high level in the past, or that at least have an income level high enough to make for a potentially substantial donation. Your volunteers and employees are an excellent referral source of highinterest donors. After all, people spend time with others like themselves. Those that work so hard to make your charity a success spend time with and talk with people that have similar interests. This means that offering your fundraising staff incentives for referring donors could be a low-cost or no-cost in-house way to contact high-interest prospects. Successful fundraisers have targets. They know when they are going to launch their fundraiser, they prepare in advance, they have dedicated waypoints along the way where they check their progress and make changes, and they keep in constant contact with their team members. Some charities take a less detailed approach. They know it is that time of year again for their annual fundraiser, so they contact previous donors, get in touch with their volunteers and tell their staff. They do a little advertising and reach out to social media, and when the end date for the fundraiser rolls around, they haven't hit their target. They say that the devil is in the details, and this is the case with the successful fundraisers. You absolutely must establish a timeline that has more than just a start and end date. How much money do you need to raise? Add 20% or 30% to that figure and make that your revenue target. Begin advertising and getting the word out through your collection staff at least 30 days in advance of your fundraiser launch date. Email your donor and prospect lists. The more detailed you can make your fundraiser the better your results will be. This includes continually checking your donation level and letting everyone know the financial targets you are aiming for each day and week. If you hold an annual fundraiser at the same time each year and run it for the same duration, you often find you get better than usual results because your prospects and previous donors know when to have money set aside to help you hit your revenue target. It used to be that charitable organizations would simply ask for donations to help them reach their revenue targets. They would wax eloquently about what their charity was providing for the community and how the prospective giver could help make the world a better place with their donation. Since that was away most charities pursued funding, and everyone was doing the same thing, people were used to this type of approach. Someone down the line decided that if they could give a donor something of value in return for their donation, they would probably make more money than using the old school nothing-for-something approach. The groundbreakers who began incentivized fundraising understood that people give to charities for altruistic reasons. They also understood that just about everyone likes a good value, so if a donor could receive feelgood rewards and a high-value product or service for a donation, this would improve the amount of money raised while also connecting with a charity supporter that could do some free word-of-mouth advertising for them. This is why you absolutely must offer donors a real incentive for giving. Some charitable organizations have pretty tight pockets when it comes to financing their fundraisers. They want to spend as little money as possible purchasing the products and services they will be giving to each donor that makes a monetary gift. This is a viable concern for charities that don't have a lot of money for this stage of the fundraising process. While this may be an issue in some instances, charities need to understand there are plenty of companies that don't require an upfront purchase from NPOs and charities. They will offer coupon booklets and sometimes physical products or services the charity does not have to pay for on the front end. All the charity does is promote a company that has something to sell, and whenever a referral ends in a sale, the charity gets a flat referral fee or commission percentage. A lot of people may not be able to give $50 or $100 at one time, but they can easily afford $5 per month. You are missing out on a lot of potential donor money if you only offer one-time donations. The recurring model can often bring in more money per donor per year because it is easier on the pocketbook or wallet of the person making the donation. There is another reason the recurring monthly or quarterly donation model works. People are creatures of habit. Once they have made a few recurring donations to your charity, this becomes a part of their regular financial activity. It begins to seem abnormal to them if they do not give when expected. Set this recurring option up on an auto-debit feature for your donors and the results will be better still. Stephen George is a fundraising expert. He has more than 30 years of experience running fundraisers for charities and other NPOs. He has worked with organizations like UNICEF and the NSPCC and currently serves as the vice chairman for the United Kingdom's Institute of Fundraising. He advises charities to adopt a digital platform if they expect their fundraisers to be successful. George points out that the telephone used to be the go-to money generator for fundraisers. There were of course radio and billboard advertising flyers and door hangers, and other types of marketing techniques. By and large, though, it was the telephone that generated the most money for charities during their fundraising efforts. Times have changed. The veteran fundraiser points to statistics which show that in 2015, 93% of donors polled stated they used their tablet or smartphone to make a charitable donation. Before you believe this was a study probably slanted towards the younger crowd, think again. The heavy prevalence towards mobile donations showed in all age groups, even those over 65 years of age. This means creating a fundraising website or blog is a must-do activity. Your charity probably already has a website, and adding a blog dedicated to your fundraisers is essential for success. Over time Google and other search engines will index the pages of your fundraising blog, and you will eventually receive free, laser-targeted donor traffic. Considering the 93% mobile giving statistic research firm Dunham + Company uncovered that Stephen George referred to, you must also make sure the experience is easy to give on a mobile device. This doesn't mean you should abandon the telephones. Some older prospects have become used to the telephone fundraising pitch after several years of making donations that way. The move to digital and mobile means you should be tracking how your donors give, and where the largest dollars per donation originate. You will probably find that people who give on a mobile device may not deliver the largest dollar per donation figures, but they will undoubtedly provide the most significant overall amount of your donation dollars.